Now that we have a feel for the star makeup of post-merger NBA champions, let's take a look at which teams stand out historically. The "star charts" from the previous section are repeated on this page for your reference. As a reminder, 6+ BPM loosely equates to All-NBA First Team (top five), 4+ BPM to All-NBA First, Second, or Third Team caliber (top 18), 3+ BPM to All-Star level play (top 30), and 2+ BPM to top 55 or so in the league. All observations cover 1977 through 2015. The 1992 Bulls are the only champion to feature three players with 6+ BPM – Michael Jordan (8.3), Horace Grant (7.3), and Scottie Pippen (6.5) were second, fifth, and sixth in the NBA that year. Pippen played 38.6 MPG to Grant’s 35.3, so he was slightly more valuable overall (see VORP). Six champions had three players with 4+ BPM - the 1981 Celtics (Bird, Parish, Maxwell), 1991 and 1992 Bulls (Jordan, Pippen, Grant), 1996 and 1997 Bulls (Jordan, Pippen, Kukoc), and 2002 Lakers (O’Neal, Bryant, Horry). It’s easy to quibble with Robert Horry, and perhaps Cedric Maxwell, though he was 1981 Finals MVP. The 1996 and 1997 Bulls are the only champions to feature four players with 3+ BPM and 24+ regular-season MPG - Jordan, Pippen, Kukoc, and Rodman. If we reduce our minimum to 18 MPG, the 2014 Spurs become the only team with five such players (Kawhi, Ginobili, Green, Duncan, Mills). The 2008 Celtics are the only champion with six players at 2+ BPM (24+ MPG) (Garnett, Pierce, Allen, Posey, Rondo, Perkins). Knock the minimum down to 18 MPG and the 1996 and 1997 Bulls also boasted six such players (Jordan, Pippen, Kukoc, Rodman, Harper, Kerr). With two 6+ BPM players at the top, the 1996 and 1997 Bulls and 2005 and 2007 Spurs are unique in their combination of superstars and super depth. Seven champions had only two players with 2+ BPM (18+ MPG) – the 1978 Bullets (Unseld and Dandridge), 1979 Sonics (Williams and Sikma), 1984 Celtics (Bird and Parish), 1987 Lakers (Magic and Worthy), 2001 Lakers (Shaq and Kobe), 2006 Heat (Wade and Shaq), and 2012 Heat (LeBron and Wade). Seven champions had only one player with 3+ BPM - the 1978 Bullets (Wes Unseld), 1979 Sonics (Gus Williams), 1984 Celtics (Larry Bird), 1987 Lakers (Magic Johnson), 1994 Rockets (Hakeem Olajuwon), 2003 Spurs (Tim Duncan), and 2006 Heat (Dwyane Wade). 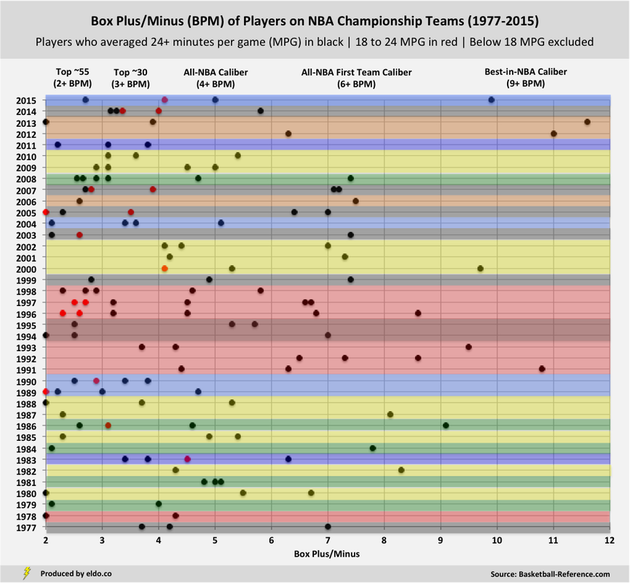 ​The 1990 Pistons and 2011 Mavericks are the only two champions that had no players with 4+ BPM. The Pistons featured Bill Laimbeer (3.8), Dennis Rodman (3.4), and Isiah Thomas (2.5), while the Mavs were led by Dirk Nowitzki (3.8), Jason Kidd (3.1), and Tyson Chandler (2.2). Cue the debates! In part three, we look at this season's conference finalists, comparing their star makeup to champions past. We randomly sampled 17 seasons between 1976-77 and 2014-15 and calculated the number of players who finished at or above each BPM threshold, disregarding those players who put up high BPMs with little playing time, and adjusting the number of players per season at each level so as to produce a 30-team equivalent. On average, 0.98 players finished with a BPM of 9+ ("Best-in-NBA Caliber"), 4.95 with a BPM of 6+ ("All-NBA First Team Caliber"), 10.02 with a BPM of 5+, 18.25 with a BPM of 4+ ("All-NBA Caliber", with a little extra cushion), 30.6 with a BPM of 3+ ("Top ~30 Caliber"), and 54.6 with a BPM of 2+ ("Top ~55 Caliber"). See footnotes in part one for more detail. Prior to joining FiveThirtyEight, Benjamin Morris wrote a magnum opus on why Rodman is undervalued: The Case for Dennis Rodman. Win Shares and Win Shares per 48 Minutes (WS/48) are kinder to Bosh, placing him behind Wade as the team's third wheel (more so in 2013). If we raise the minimum to 24 regular-season MPG, the 2000 Lakers and 2003 Spurs are in this category too. Horry (Lakers) and Ginobili (Spurs) played strong third fiddle at 2+ BPM, but with somewhat limited regular-season MPG (22 and 21, respectively). Both went on to average 27+ MPG in the playoffs. Elvin Hayes led the '78 Bullets in Win Shares and tied with Wes Unseld for second on the team in WS/48 (24+ MPG), behind Mitch Kupchak. Kevin McHale tied Parish for second in Win Shares on the '84 Celtics, and was second to Bird in WS/48 (24+ MPG).